Pregnancy, aging, and major weight fluctuations can often leave individuals with stretched-out abdominal muscles and loose, sagging skin in the midsection. If this sounds familiar, tummy tuck surgery or “abdominoplasty” could help you achieve a flatter, better-contoured abdomen. This waist contouring procedure surgically removes excess skin and fat deposits from the abdomen and repositions the abdominal muscles into a tighter alignment. A tummy tuck will recontour your waistline to give you the firm, flat, and youthful abdomen you want. If a Tummy Tuck is the procedure you are looking for, get started and contact Dr. David Morales in Dallax, TX for your consultation. Abdominal bulges and laxity are caused by loose skin, stubborn fat, and weakened or separated abdominal muscles. Tummy tuck surgery addresses all three of these concerns and gives you a tighter and smoother abdominal contour. Pregnancy or weight loss can leave sagging skin and stretch marks on the abdomen. Tummy tuck surgery removes damaged, excess skin of the lower abdomen along with many stretch marks to give you a flatter, smoother, and more youthful abdomen. Belly fat can be particularly resistant to exercise and diet. Abdominoplasty corrects the tummy bulges caused by stubborn fat and removes the excess fatty tissue to create flatter and smoother abdominal contours. Fluctuations in weight, pregnancy, and previous surgeries can cause your core muscles to become weak, damaged, and stretched apart. Tummy tuck surgery restores the tight alignment of the abdominal muscles to create a firmer abdominal tone. Because a tummy bulge is often caused by pregnancy or aging, irregular abdominal contours can make you look older or “matronly.” Abdominoplasty removes excess skin, tightens the muscles, and eliminates fat to produce a more youthfully firm and flat waistline. Abdominoplasty techniques may vary considerably depending on the amount of skin laxity and fat deposits present. The following variations allow Dr. Morales to customize the procedure for your unique needs. The details of the procedure will vary depending on the technique chosen for your tummy tuck. You will be given general anesthesia for the duration of the surgery, which typically lasts two to three hours. The procedure is performed either on an outpatient basis for a mini tummy tuck or with an overnight stay for the standard or extended tummy tuck procedures. Dr. Morales will perform the procedure by making the appropriate incision, tightening the muscles, removing excess skin and fat, and recontouring the waist. More details about your specific procedure will be provided for you during your consultation. The length of your recovery will vary according to the technique used and your ability to heal. The recovery is generally quickest for the mini tummy tuck and longest for the extended tummy tuck, with the standard tummy tuck in between. Patients may need to stay at the surgical facility overnight after their surgery. For all techniques, patients should rest and remain bent at the waist for two to three days after surgery to avoid excessive pulling at the incisions. Most patients will be able to transition to fully upright by day three or four of recovery. Any pain can be treated with oral medications and an optional ambulatory pain medication pump that can be worn discreetly under clothing for three to five days after surgery. An abdominal binder should be worn for two to four weeks for added support and compression to minimize swelling. The timeline for returning to work can range from two to four weeks. Exercise should be postponed for a full six weeks. By this point, most of the swelling will be gone, and the results will be visible. The cost of abdominoplasty varies according to the technique used, surgeon’s fees, anesthesia fees, facility fees, and other factors. A detailed price quote will be given to you after your consultation. Tummy tuck surgery can produce a dramatically flatter and tighter stomach. In correcting the vertical separation of the abdominal muscles and removing excess skin and fat, abdominoplasty significantly improves the contour of the waistline. The striking results obtained with tummy tuck surgery will be further enhanced with proper exercise and diet after your surgery. See this smile on my face? You put it there! Your honesty and great work are appreciated. Dr. Morales may recommend tummy tuck surgery to men or women who are bothered by their weakened abdominal muscles, stubborn belly fat, and loose, stretch-marked abdominal skin. Candidates should be healthy nonsmokers with a stable body weight. The best candidates will not be planning to have any future pregnancies because subsequent pregnancies will likely reverse the results of abdominoplasty. Can I combine tummy tuck surgery with breast surgery? Tummy tuck surgery can be combined with breast surgeries, liposuction, and a variety of other body contouring procedures to improve your appearance. It is often performed as part of the Mommy Makeover to address body contour concerns that are frequently found in women who have been pregnant. Why might a tummy tuck be necessary to improve abdominal muscle tone? Abdominal laxity and bulging are related not only to the skin and fatty tissue but also the muscles underneath. The abdominal muscles that help you do sit-ups also hold your belly in and support your back. Pregnancy and weight loss can cause these muscles of the abdominal wall to pull apart. When the muscles separate, it causes the bulging belly you see on the outside. This is not a hernia or a hole in your belly wall; it is just an overstretching and looseness in need of repair. Exercises such as sit-ups will make your abdominal muscles stronger, but they cannot sew them back together. This is where tummy tuck surgery comes in. A tummy tuck surgically tightens the abdominal muscles and brings them back together so that your abdomen is once again flat and firm. Which technique will I need? Your technique will be selected to meet your goals and anatomic needs. Once you have been properly assessed by your physician, your specific surgical goals can then be discussed to maximize your results while minimizing your incisions and recovery time. Scars are likely to form wherever the incisions are made. 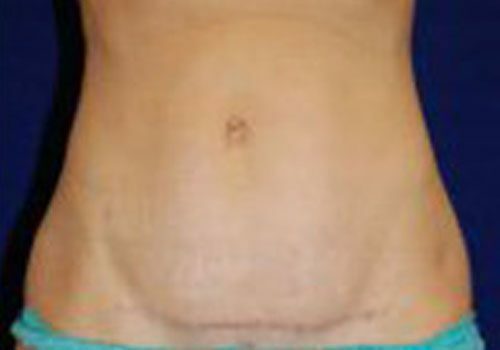 Patients who get a mini tummy tuck are likely to have more modest scarring than patients who get other tummy tuck techniques. However, since scars are to be expected with all techniques, patients should take care to place the highest priority on choosing the technique that will give them the best overall results for their body contour. Scarring is also affected by your ability to heal. Whenever possible, scars are placed discreetly so that they may be hidden by clothing. To minimize scarring for your incision, carefully follow the postoperative instructions given to you. All scars are likely to fade over time. Will abdominoplasty help me lose weight? Abdominoplasty is not a weight loss procedure like the lap band or bariatric surgery. A tummy tuck is a body contouring procedure that restores a firm and flat abdomen. At most, patients will lose a small amount of weight from the removal of excess skin and belly fat. Still, the benefits of improving and rejuvenating your waist contours may create the impression that you have lost weight. The results of tummy tuck surgery can last for many years. Patients can help guarantee long-lasting results by exercising regularly, eating a nutritious diet, and avoiding weight gain and pregnancy.